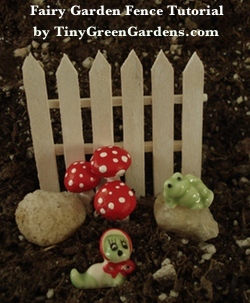 This is part II of a two-part tutorial on building a fairy garden fence. As mentioned in Making a Fairy Garden Fence – Part I, you’ll need paint, glue, wire cutters or another tool that can cut through thin wood, match sticks and mini craft sticks . I wouldn’t recommend that you put them into dirt without putting a finish layer on them first. There are some paints which say they can be cured to the point of being dishwasher safe and they might provide an option. 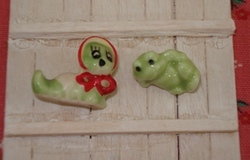 But, I would test a few slats to see if they are waterproof before adding them to a terrarium or fairy garden. When I first tried to assemble a section of fence, it seemed a bit like a wrestling match where the little bits of wood were definitely winning. As you can see from this sample, the glue ended up everywhere and made for a fairly unattractive fence. Even Tim and Gerty were not happy how it turned out. There had to be a better way too keep everything from dancing around and getting out of place. And, that way, had to involve an approach to gluing that allowed for more finesse and a neater end product. Using some little pieces of painter’s tape made fence assembly a snap. It even provided a straight edge to line up the pickets with. You could probably use masking or transparent tape but I was worried they would leave glue residue behind and either prevent the paint from sticking or cause everything to stick to the fence. Keep in mind, when assembling your fence, to allow for sticking some of it into your garden’s surface. If you put the support rails too low, they will wind up sitting on the dirt of your garden. Using a toothpick, I painted some glue onto one side of the matchsticks and placed them on the pickets. If you have fat or clumsy fingers like I do, placing the fence rails i.e. matchsticks is much easier with a tweezers. I use a bent head tweezers as I think it holds the pieces nicely and makes it easier to see what you are working on. If you don’t have a bent head tweezers, there’s a nice 6Pc General Purpose Tweezers Set on Amazon that is under $10 and has a nice variety of tweezers for crafters. I’m not really sure how much actual instruction you will need for this part of building your own fairy garden fence. I think the pictures are pretty much self-explanatory. To space my pickets, I used a simple technique – spacers; in this case some matches. The only trick to this method is to carefully remove the spacers before you begin gluing on the support rails. I ended up using my tweezers to peel the matches off of the painter’s tape. That allowed me to hold onto the rest of the fence while lifting the matches out from between the pickets. Notice too, how the painter’s tape provided a nice straight edge that I could use to align my pickets up against. I didn’t really worry about the matches being even, the main issue with them was making sure the pickets were tightly placed next to them. But, in the end, I doubt the fairies would complain if your picket fence was slightly out of square. Here’s a picture of some different fencing that I made. The first fence was made from craft sticks that had been made a bit shorter. The second one is a traditional stockade fence and the third is a taller example of a picket fence. 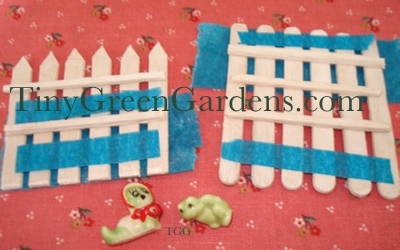 I found it was great fun making these little fences and it was a bit addictive. The worst part of building a fairy garden fence is the long periods spent waiting for glue or paint to dry. But, in the end, the cuteness of these little sections of fence makes it well worth it. Don’t you agree? 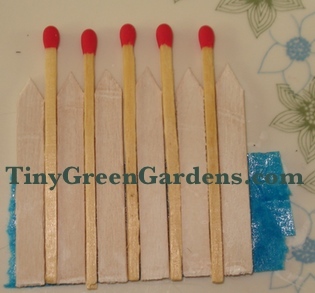 Love the idea of using the matches and painter’s tape. I bought a bunch of that tape for its intended use. It didn’t work like I had hoped. Maybe I can use it for fences instead.